Heavy Duty – a high specification design for demanding applications. Economy – a lower cost, simpler design for sand applications. Both units have the same paddle profile and are directly coupled from the motor through to the paddles to enable high start-up torques. Attrition Scrubbing is a process where a mineral is scrubbed by the action of one high speed slurry flow impacting on another. The advantage of this type of attrition is that as it is being provided by two slurry flows there is little wear on the machine itself. Two opposed, shaft mounted, turbine type impellers generate opposing slurry flows that provide high particle on particle impact. The ideal solids concentration is 70 to 80%, dependent on the mineral, this giving the maximum particle on particle contact. 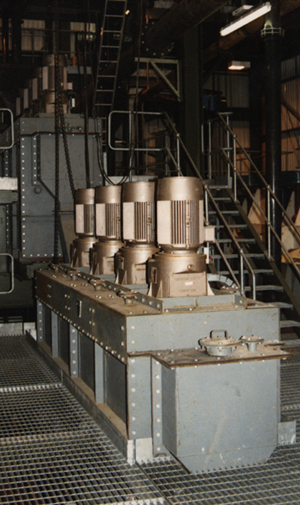 A scrubber consists of a series of inter connected cells. A differential pitch between the impellers causes the slurry to be pumped from one cell to another through the scrubber. The impellers are driven by heavy duty geared motor units that give long and trouble-free life. The drives are supported by a ridged super structure and direct coupling from the motor through the gearbox to the impellers allows the motors to be started, in the majority of cases, with the scrubber full of settled sand. This obviates the need to drain down when the process is stopped. 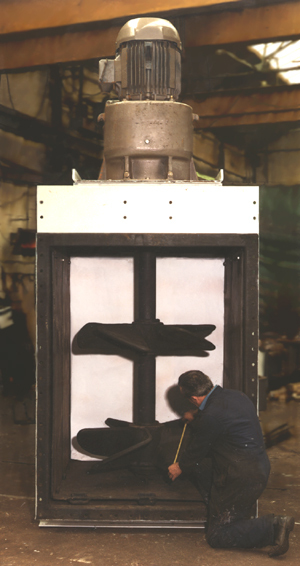 The tank, impellers and shaft sleeves are covered with abrasion resistant rubber. Other linings such as neoprene and hypalon are available to suit particular application. For particularly abrasive materials additional wear protection can be provided by removable, reversible rubber covered wear plates. These provide an extra heavy duty unit that eliminates down time relining the tank walls. The scrubbers are also available with a range of lining material to suit particular chemical requirements. These machines are suitable as reaction vessels in leaching plants, as the attrition effect can reduce the overall retention time required. The scrubbers can be sealed with submerged feed and discharge points to allow for gas purged operation preventing the oxidation of process chemicals . Optional sloped cell bottoms allowing for easy cleaning between different products on toll washing applications. Capacity of 15 litre per cell. • Single cell for batch operation. The results from the Floatex Laboratory Scrubber are, in most cases, directly comparable to those achieved by production units.